Home arrow_forwardDoobert Sayingsarrow_forwardBe a rescuer; save a life. You can be a rescuer and save lives every day just by volunteering to help animal rescues. We’ve made it simple for you to get started saving animals. 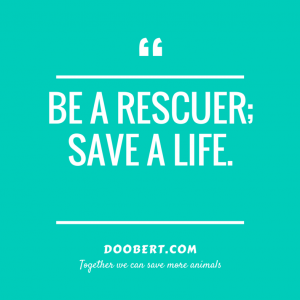 You can sign-up on Doobert to be a rescue relay transporter, a foster home, a photographer and even volunteer to help animal rescue groups with their social media. So sign-up today and join us so that together we can save more animals.